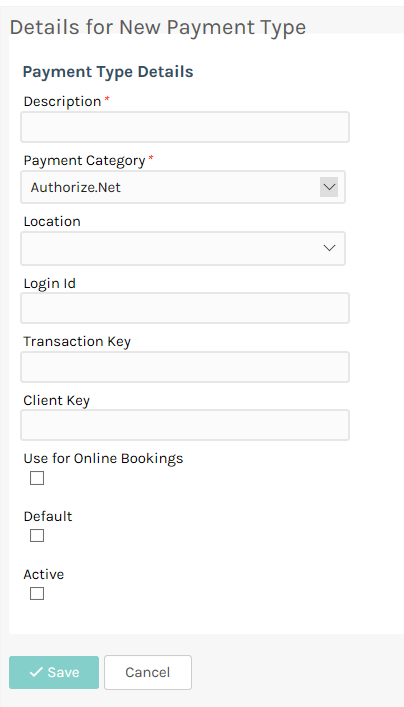 If your payments company supports Authorize.Net you can integrate with the sales screen and take payments directly. There are a few steps to configure this but it is fairly easy. When setting up the Authorize.Net payment type there are three bits of information you will need. These are the Login Id, Transaction Key and Client Key. Your payments company should be able to give you these codes but if not they should give you a login to the Authorize.Net portal so you can retrieve them yourself. To obtain your Login Id and Transaction Key follow these steps. Click Manage Public Client Key. Select your Client Key for setting up. Important information: Your Authorize.Net account must be set up as Card Not Present or transactions will fail. 2. In the Setting screen under the Payments section click the Manage Payment Types option. 4. Make sure to enter all the details as indicated in the screenshot below, specifically the Login Id, Transaction Key, Client Key and Payment Category, then click Save to add it. 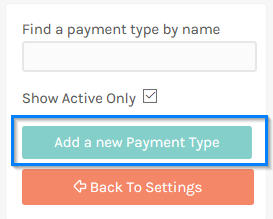 Your payment type is now ready to use and will be an option when performing payments in the Sales screen. If you wish you can integrate with a card reader. The Authorize.Net configuration only supports electronic stripe readers such as these MagTek readers . Before purchasing a reader contact us to ensure it is compatible. Better is to use our Apriva integration which uses a modern and more secure pin-pad. If you do wish to use the electronic stripe reader follow these steps. Plug your card reader into a USB port on your computer. It should be automatically detected by Windows. Scan any credit card in the card reader. Don't worry, you won't be charged anything. If the reader is configured correctly a line of characters will appear in Notepad as if they were typed. If when you scan nothing appears in Notepad you will need to consult the manual that came with the card reader to ensure it is in keyboard mode or contact the company the sold it to you for help. Authorize.Net is now ready for use and will be available under the Gateway button when performing a payment in the Sale screen.